The Oaks B&B , stands in a beautiful site (Natural park of Aurunci mountains) on a 300 ft plateau with wonderful views over the terraces , gardens , swimming pool , courtyards and across the surrounding valley. It is located half road Rome and Naples, ideal for everybody who wants to visit these cities . 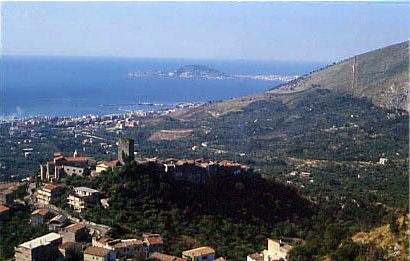 The B&B is 10 minutes from the "Riviera di Ulisse" coast . It is possible to organize tours to Rome , Pompei , Capri and Naples . The B&B ensures the ultimate in gracious hospitality and attention to every detail . The guests can enjoy the staying at the "Oaks" relaxing themselves in the swimming pool and walking across the natural park. The rooms , luminous, spacious and tastefully furnished, have a panoramic views, fitted with telephone line , air conditioning, hairdryer , sat TV and private bathroom. Breakfast, which is rich and abundant is served in the dining room with its fireplace or in the garden . Home made marmalade , crumble cake and salami are some of our speciality . We offer privacy and precious silence only broken by cicadas and birds. Drink local home made wine and is prepared by the owner with fresh fruits and natural products. The guest must pay 30% of the entire sum of money at the moment of the booking. The guest pays a penalty if there will be a cancellation of the booked room after 10 days. Motorway A1 ROME-NAPLES , exit Cassino; S. S. 630 (Ausonia), direction Formia after 20 km , KM number 23 turn right (Via Piscinola 143). By Train : Railway line Rome-Naples , stop in Formia station . Bus line from Formia to Cassino , stop in Spigno Saturnia .